Cheap flights from Paris to Mexico City from €403 return! Cheap return flights from Germany to Hanoi, Vietnam from just €264! Cheap flights from Paris to Mexico City from €403! Find the lowest priced deals France Mexico and book your next cheap return flights from Paris to Mexico City based on Oneworld airlines promotion. (Iberia, American Airlines or British Airways). If you are budget travelers in France looking for the cheapest flights to Mexico City also next main tourist season do not miss this sale. Based on discount of Iberia, American Airlines or British Airways you can fly to this usually fairly expensive destination. These cheap flights Paris to Mexico City are inclusive of all taxes, onboard meals and checked bag. Take advantage of this Iberia promotion and book cheap flights from Paris to Mexico City also in winter season 2019/2020…In addition you can also book discounted fares to many Mexican destinations such as to San José del Cabo. Puerto Vallarta. Oaxacana, Ixtapa, Acapulco, Veracruz, Oaxacana or Tuxtral Gutiérrez. Oneworld promo sale offers the cheapest flights from Paris to Mexico City from 12th of February to 23rd of March or 29th of October to 10th of December 2019. Max stay 3 months but all travel must be completed by 31st of December. At this moment good availability in said travel period. September is end of a rainy season there and from November it begins peak season in Mexico. You can book cheapest flights Paris Mexico City by 31st of January. Below you can refer to our booking as well as few travel samples. Mexico City is the capital city of Mexico, and the largest city in North America by population. The greater Mexico City metropolitan area is one of the world’s largest and the largest city by population in North America, with an estimated 26 million people living in the region. It is shaped roughly like an oval of about 60 by 40km, built on the dry bed of Lake Texcoco, and surrounded on three sides by tall mountains and volcanoes such as the Ajusco, the Popocatepetl and the Ixtaccihuatl. If you have booked these cheap flights from Paris to Mexico City you can read more about this interesting destination at Wikitravel. Travel dates. 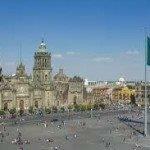 : Compare the cheapest flights Paris-Mexico City at website of the carrier. Need affordable hotel in Mexico book your accommodation via Booking.com or Hotels.com. If you have booked these cheap flights from Paris to Mexico City you can also compare best prices for car rental in this destination via Rentalcars.com. Booking sample of cheap flights from Paris to Mexico City from €403 return! Your outbound date from Paris to Mexico would be on 4th of March. Inbound flight from this North American country back to Paris on 18th of March 2019. Take advantage of this latest promotion from France to Mexico and book the cheapest flights from Paris to Mexico City!